Exciting developments hold promise, but progress may not be as swift as you anticipate. By concentrating on the best ways to broaden possibilities within a framework of reason you’ll enjoy the greatest rewards. Although staying active is always a good idea, it’s easy to overdo it and end up paying the price of fatigue or sore muscles as a result. Allow ample time for stretching each day, and attempt to maintain a balance between work, play, and rest. You may feel that you’ve been deceived by someone you trust, but it’s also possible that you simply misunderstood a delicate situation. Be careful with your own promises, since you may try to avoid telling the truth to save your pride. Honesty wins the day during the Moon on April 15. Family matters need extra attention during the Moon on April 30, when control issues can emerge in full force. Business meetings or presentations provide an excellent avenue to showcase your pet projects or ideas, and they’re especially promising after April 13. Response can be slow, although favorable. 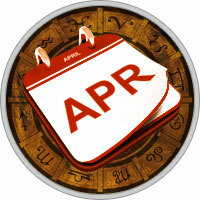 Financial matters require finesse after April 10, and negotiations are fraught with innuendo and deception after April 18. Your integrity remains strong, although it’s tempting to sink to the low level of your detractors just because they have it coming. By looking beneath the surface you’ll avoid the entrapment of a pretty, but empty, package. Demand accountability from yourself and others.